The track has posted their 2017 schedule and they have the Mid Atlantic Mopar event at Mason Dixon on May 20,21st this year. We have 4 1/2 months to make this a huge race this year. There is no reason that I can think of that we can not have 20 cars! We had 17 & 18 last spring with lots of people who did not get to come out. So get with the program people! I know many of you have been working on new rides and updates to old ones, so it is time to mark your calendars. Let's try and get some new blood out and encourage some old folks to come back and race with us again. More info to follow. Of course this is still depends on approval of the racers at the banquet next month. Sounds great to me. I might even try to bring two cars... 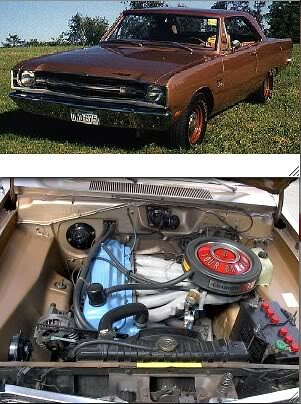 Dying to run the 68 Dart after some upgrades! As of now it is just 3 of us!! Just kidding! I just heard from Derick Sword so I will go ahead and start a list, Let me know if you are planning to make it. I'll add a couple of normal regulars to the list. If you are not coming let me know also. Last edited by Rick Covalt on Sat May 06, 2017 4:21 pm, edited 1 time in total. I talked to Elmer last week and he did say that they would indeed be checking helmets at tech this year. So if you run 13.99 or faster be sure you have the up to date tags / sticker in your helmet. Also remember if anyone is trying to break a record and adding weights you need to make sure it is secured properly. Turtle has also retired from the crew there so we won't see him in the staging lanes or tech this year! He was quite the character and always loved seeing us come to race. Anyone else know if they are coming? I spoke to Will and he can not make it this spring! Long Live turtle and his antics. Gee, looks like they have test'n'tune Friday night. I will plan to be there for that. Anything suggesting we won't have that, Rick? They have the cycles there Friday and Saturday. I have an e-mail in to him asking if we are able to do the T & T on Friday and the correct time for us to be ready on Saturday. Anyone else coming? Sure hope a few more plan on it. Anyone know if Brian Mimken got his car back together? have not seen him here much lately. If they have the TNT Friday, well then I am in to tnt there! If not I may TNT here at Pittsburgh Friday Evening, then Come out Saturday. Waiting for Friday Nite TNT confirmation Rick! It is unclear on the keep and share if that tnt is for the motorcycle group only... or not? Depending on the wife and step-daughter's camping plans, I may come on up as a spectator only. If they go camping, then I will be babysitting the 3 hounds making sure they get out to do their business several times during the day! One of these years I might get the interior installed in the slant 87 D100 (still in the same condition as 3 years ago!) or get my 65 wagon done - yes I am slow! We should be able to be there for TnT on Friday depending on what you find out Rick. We are able to do T&T on Friday evening. Also on Saturday 9:00AM starts the open test runs. I don't know how many Motorcycles are there on those day but it is a National meet for them, so there may be a lot. More details to follow. Sounds great, Rick! See you Friday eve... Should be tons of fun. I am not sure at all what I am doing, but probably will be there Friday. Patti is still very sick and she can't drive. So she may not be able to come down to the track at all and help with food. She is still only able to stay up 3-4 hours at a time. But I will bring some food and try and keep it hot! I'm sure we'll have some fun. Looking forward to seeing my Slanted family. Still have not heard from many people. So please kick the bushes a little.